9102 Chelsea Boston ship’s bell clock in the original box. Boston is the name Chelsea used for a line of clocks that were made in West Germany using Chelsea movements. It comes with the original cardboard box and packing plus an envelope with a small instructions booklet and the original key. I do not think this clock was ever used because it came with the original rubber stopper in place to keep the hands from moving during shipping. This is an eight-day clock with hour and half-hour ship’s bell strike and it is running. 7 ½ inch case diameter with a 5 ½ inch dial. $275. 9103 Chelsea Boston ship’s bell clock. This is the same model as the clock previously listed but this one has been used. The case finish has darkened and it would benefit by being polished. There are no case or rim damages from being dropped or other abuse. It is missing the bezel glass however. 9104 Weems and Plath Trident quartz ship’s bell clock. This company has been in business in Annapolis, Maryland since the early 1900s. Google them. They have a rather interesting history. They are still in business today selling high quality navigation tools and weather instruments such as compasses, barometers, clocks etc. This example was made in Germany. I do not know the age of this particular clock but this model is still being produced today and the retail price is $140.99. The condition of this clock is almost like new and I doubt that it has been handled very much. The lacquer finish is in good condition, the solid brass case is nice and bright and the silvered dial is perfect. The clock strikes ship’s bell time on a delicate sounding bell every hour and half-hour. Powered by an AA battery, it is in good running order and I will even include the battery. 9105 Low Clock Co. Admiralty 4 ½ “ ship’s bell clock. I do not know much on the history of the Low Clock Company other than they were located in New York City, probably supplied military timepieces and were perhaps connected in some way to Chelsea. This particular model was made in Germany. It has a solid brass case with an excellent brushed finish. This clock appears to be in near new condition showing no wear at all. The 24 hour dial is perfect and it has the original hands. The bezel is the screw on style. This is an eight-day clock with hour and half-hour ship’s bell strike on a gong and it is running. The movement is key wound with a 7 jewel platform balance escapement. 9106 Low Clock Co. Admiralty 7” ship’s bell clock. As I stated for the previous clock: I do not know much on the history of the Low Clock Company other than they were located in New York City, probably supplied military timepieces and were perhaps connected in some way to Chelsea. This particular model was made in Germany. It has a solid brass case with a polished cast brass bezel having a thick beveled glass plus a brushed brass housing. The housing portion is dull and could use polishing. There are no dents, scratches or other case problems. The bezel is the hinged style and in the photo it is missing the screw-on knob on the right. I since found a small brass bolt which fits and is a workable replacement. It has a signed 24 hour military style dial which is in excellent condition and it has the original hands. This is an eight-day clock which strikes ship’s bell chimes on the hour and half-hour. It is key wound, has a balance escapement and it is running. 9107 Weems and Plath Endurance ship’s bell quartz clock. As I stated for a previous clock: this company has been in business in Annapolis, Maryland since the early 1900s. Google them. They have a rather interesting history. They are still in business today selling high quality navigation tools and weather instruments such as compasses, barometers, clocks etc. This example was made in Germany. It has a solid brass case with a normal amount of aging on the lacquer finish. There is a very heavy hinged style bezel with a thick beveled glass. The dial is excellent and it has the original hands. 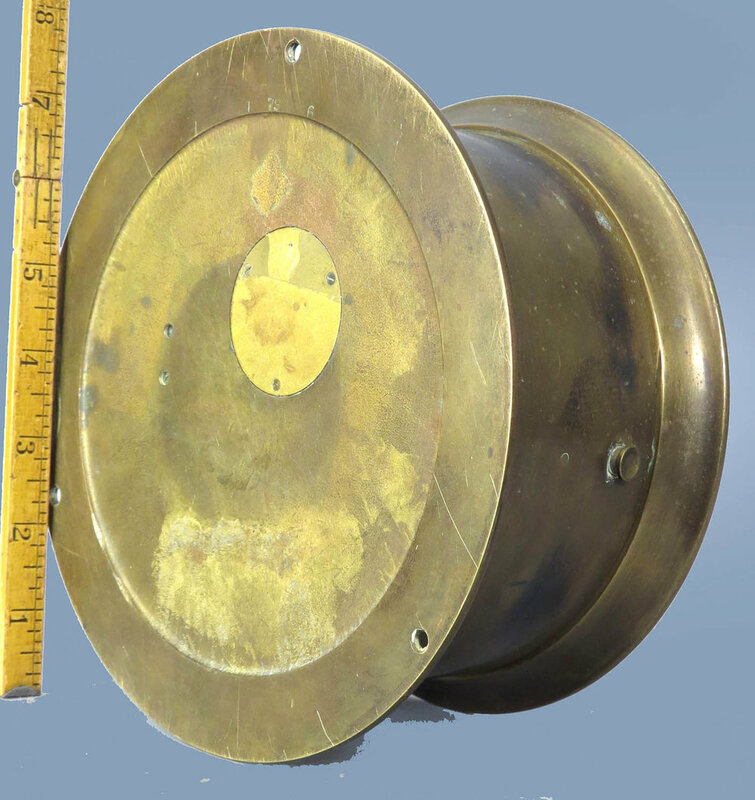 Today, the list price for the Endurance line of ship’s bell clocks ranges from $160 to $499. This clock strikes ship’s bell time every hour and half-hour and is powered by an AA battery which is included. It is in good running order. 9108 Seth Thomas Wheel ship’s bell clock. This clock is in as found condition. It is a good-looking clock with a cast brass bezel and spoked wheel front. That portion is in good condition. However, the brass housing portion has a crack that goes from one of the spokes through the threads for the bezel making it impossible to screw the bezel on as it is. Perhaps you can correct that or use this clock for parts. The signed silvered dial is in good condition and it has the original hands. This is an eight-day clock with hour and half-hour strike on a gong and it is running. 8 ½ inch overall diameter with a 4 inch dial. $55. This black Bakelite case is in very good shape with good color and without damages. It opens with a hinge at the 12 o’clock position. The original silvered dial is very legible and has just a bit of discoloration. The hands are original but the tail portion of the center sweep seconds has broken off. However, I have it and am including it. Manufactured by Talley Industries of Norcross, GA, this clock is dated 1987. The Seth Thomas clock company was moved there in 1982. It has a solid mahogany base with a brass platform. The mahogany does show some scratches perhaps caused by the key or bezel when the clock was being wound. The brass housing is in good condition without any dents or scratches and the bezel is the screw on style. The signed silvered dial is in near perfect condition and it has the original hands. There is a complete label under the base and it comes with the original instruction booklet and key. This is an eight day clock that strikes ship’s bell time on the hour and half hour. It looks like someone has over oiled the movement but it is running nonetheless. The movement was made in Germany.